This article first appeared on 10/17/18. Just checked the fauevents.universitytickets.com and there is a very small handful of tickets still available- so, if you wanna go and haven’t yet bought tickets, time to make a move on the ticket front! Posted on October 17th, 2018. * Pop, Rock & Doo Wopp Live! Pop, Rock & Doo Wopp returns to FAU for the 7th consecutive year starring some Boca debuts and some of your favorites who are back by popular demand! Starring… Lou Christie (“Lightning Strikes”, “I’m Gonna Make You Mind”, “Two Faces Have I”, “The Gypsy Cried”), Rock & Roll Hall of Famers The Flamingos (“I Only Have Eyes for You”, “Lovers Never Say Goodbye”, “Mio Amore”), The Belmonts (“A Teenager in Love”, “Where or When”, “I Wonder Why”, “That’s My Desire”) and The Leaders of the Pack – four original lead singers live on stage, all together, for the first time – Larry Chance of the Earls (“Remember When”, “I Believe”), Vito Picone of the Elegants (“Little Star”), Emil Stucchio of the Classics (“Till Then”) and Joey Dee of the Starliters (“Peppermint Twist”).PLUS – due to overwhelming demand from last year’s audience and so many fans who could not get tickets for our last show, we’re bringing back Jay & the Americans for an encore performance – all the hits you remember in an all-new show (“This Magic Moment”, “Come a Little Bit Closer”, “Cara Mia”, “Walkin’ in the Rain”, “Only in America”, “Some Enchanted Evening” and more!) All acts feature original members. Presented by Praia Entertainment Group. Jay & The Americans are absolutely amazing. Don’t miss them, they put on a great show. This is a great show. The lineup is amazing. I recently saw Lou Christie and he was as good as when he was 30 years old. The lineup is packed with great acts. My wife and i have tickets and can’t wait to see this show. POP ROCK puts on the best concerts. Everything is profesionally produced. Ive seen Jay & The Americans twice at FAU and they were fabulous. The “new” Jay is terrific and the backing harmonies are exactly like they were on the original recordings. 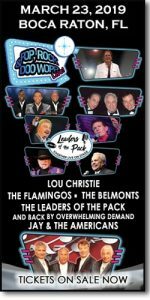 If you want to see a superbly produced Oldies concert go to this one. You will love the show. This is definitely a show to see. Recently saw Lou Christie and Jay & The Americans and both were terrific. This is a tremendous lineup. I recently saw Lou Christie in concert and he put on a great show. The FAU lineup is terrific. Can’t wait to go. My wife and I have seen Jay #3 several times and the group has never sounded better. Great lineup coming to FAU. This is a great lineup. Just got 2 tickets. Not the best seats as they are in the side bleachers, but they’ll work. A change of travel plans has us in Florida on 3/23/19. Just picked up 2 tickets. The lineup is extremely strong. My husband and I are really looking forward to seeing this show. Heard last night on Sirius that Cousin Brucie will make an appearance. Its going to be a terrific show. The talent roster for this concert is top notch. Over the past 2 years my wife and I have seen all of the listed artists and each and everyone of them put on a great show. My computer is showing me that this event is SOLD OUT. Just found 2 tickets cost $148. From what I can see, now it’s SRO.